Early Friday, the Bureau of Economic Analysis released its third look at economic growth in the first quarter. The results were disappointing: BEA now estimates that Q1 growth was only 2.7%, down from the prior estimate of 3.0%. 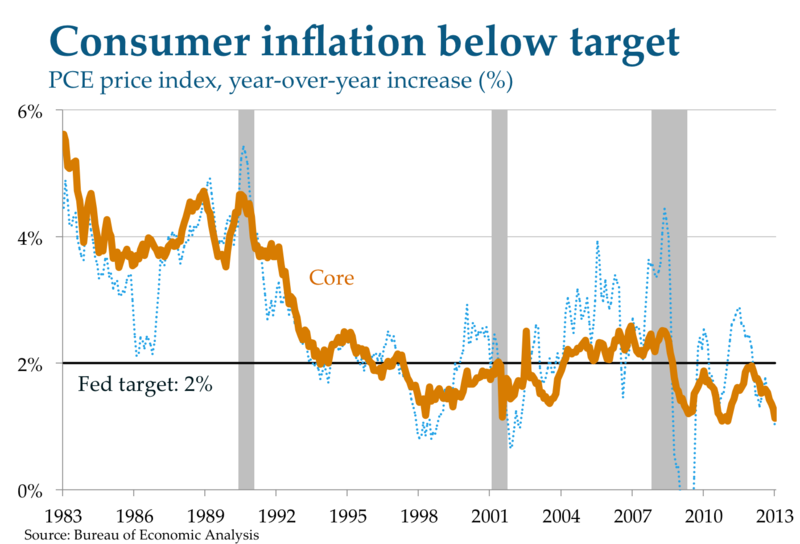 A key reason: consumer spending was weaker than previously thought. As I noted in May, the monthly release of GDP data is inevitably followed by commentators claiming that “consumer spending makes up 70% of the U.S. economy” (see, for example, here). Unfortunately, that isn’t right. 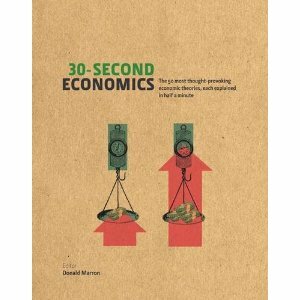 Consumer spending appears to be about 70% of the economy based on a seemingly obvious calculation (consumer spending divided by GDP), but that ignores the way that macroeconomic accounting handles imports. For reasons detailed in my earlier post, careful analysis suggests that the actual ratio is about 60%. One reason the 70% error is so common is that doing the correct calculation requires a great deal of work; for example, you need to estimate the fraction of consumer purchases that come from imports. If we want commentators to start using the right figure, we need an easier way to get the idea across using the information reported in the headline GDP release. which says that GDP equals Consumer spending, Investment, Government spending, and eXports minus iMports (which are subtracted to avoid double-counting). Looking at this identity, you see that C, I, G, and X can be viewed as measures of demand from consumers, businesses, governments, and overseas markets, while M is a measure of supply from overseas producers. To get a more reasonable measure of the importance of consumer spending, we can calculate what share of “overall demand” (C + I + G + X) comes from consumers. As shown in the chart, that measure (in red) has been roughly 60% for decades. The usual, misleading measure of consumer spending’s importance (in blue), however, has been up around 70% over the past decade, but used to be lower back when imports were smaller. 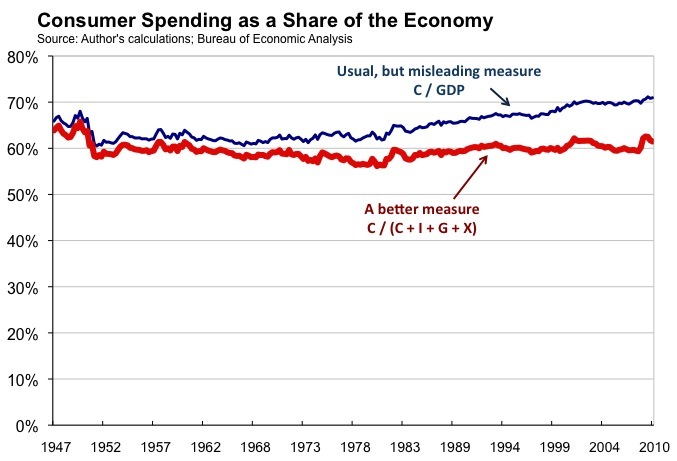 The C / (C + I + G + X) measure of consumer spending’s importance is hardly exact. For example, it doesn’t consider how much consumer spending actually comes from imports. However, it’s the simplest measure I could think of that comes close to the right answer. But maybe readers have an even better idea? P.S. Thanks to Cornelia Strawser for helpful discussion of this measurement challenge.